Home » Uncategorized » Have You Met Leeann? Leeann LOVES picture day and makes sure she gets her picture taken every single time. A young woman ascends the stage, smiles and accepts her award. The young woman is Leeann Noland. She is twenty years old, has Down syndrome and is profoundly deaf. She is accepting the United Way of the Bluegrass’ highest honor, the Courage Award. The Courage Award is given to a person who has overcome personal difficulties, and become a contributing member of the community, as well as having been involved with United Way, both as a consumer and as a representative. Leeann was a student at Growing Together Preschool, Inc. from the time she was 6 months old. 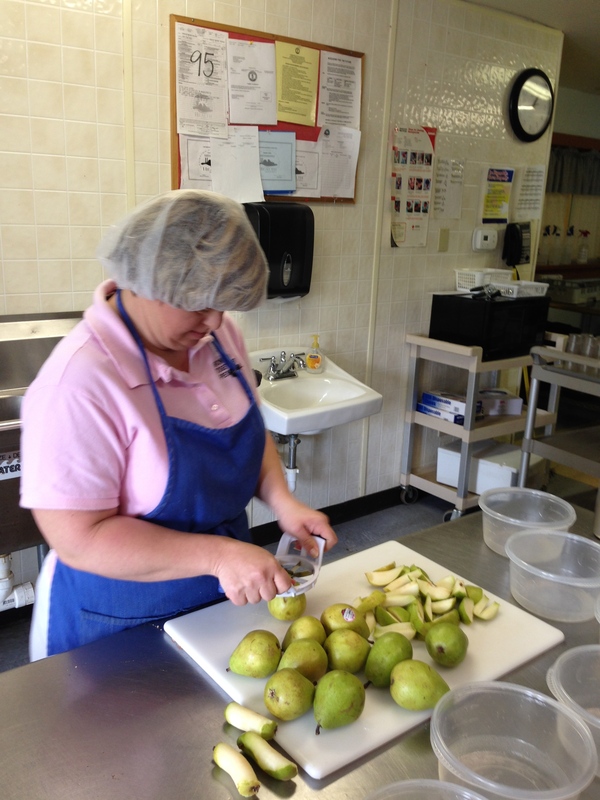 Now, Leeann is 37 years old and has been employed at Growing Together Preschool as a Cafeteria Assistant for 17 years. In August 1977, Leeann Noland was born to Larry and Betsy Noland at Good Samaritan Hospital in Lexington, KY. Betsy’s pregnancy was normal in every way. Leeann’s birth, however, was anything but normal. Betsy’s labor began two weeks before her due date. When birth monitors began to signal major problems, she was rushed to surgery for a cesarean section delivery. Leeann was born in cardiac arrest and with collapsed lungs. To add to her traumatic birth, the Nolands were also informed that their daughter had Down syndrome. Her prognosis was grim and the physicians told Betsy and Larry that in reality, their daughter would most likely die. Leeann spent three weeks in intensive care, but miraculously she rallied and showed very early what a fighter for life she would be! Leeann came home shortly before her first month birthday, having to be fed with a turkey baster. Leeann’s parents immediately began searching for help with how to best meet their child’s needs. Where were the resources to help them learn about her intellectual and physical disabilities? Who could tell them how to make this child the best she could be? They were referred to the Bluegrass Association for Retarded Citizens’(BARC) early intervention program for infants and their parents. This program would later become Growing Together Preschool, Inc. At age 6 months, Leeann and her mother made their first visit to the preschool. It was with great dread and apprehension that Betsy approached this first visit. What would these children look like? How would people treat her and her precious baby? What a wonderful surprise lay in store for both Betsy and Leeann! These children were just like everyone else! They were precious, loving children with parents who were just like her, searching for help. Betsy learned how to do physical therapy with Leeann to increase her muscle tone, learned feeding skills to help Leeann to eat better and control her tongue movements, and just generally how to relax and enjoy the gift that was Leeann. 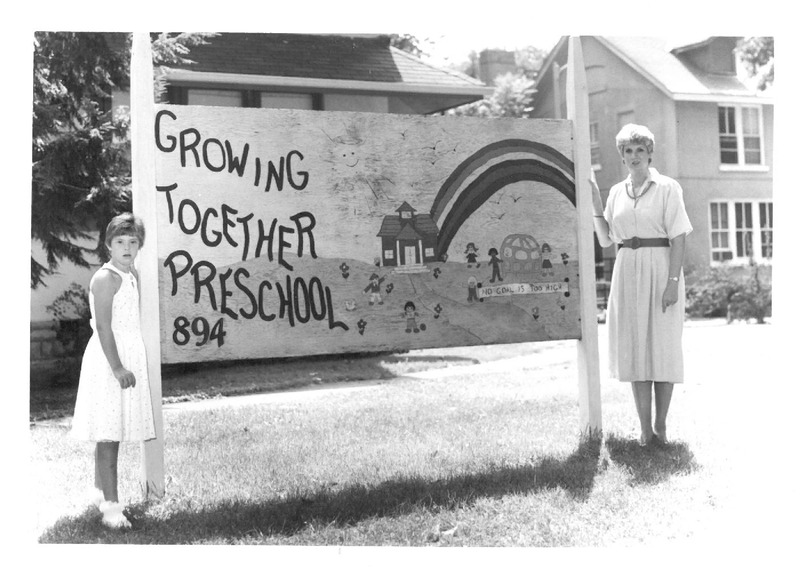 Leeann and her mother, Betsy, pose for a picture by the original Growing Together Preschool sign. Leeann was progressing very well in every way except verbal skills. She did not make many gurgling sounds or try to say “mama.” The physical therapist, Karen Tyrer, at the preschool told Betsy she felt Leeann could have a hearing problem. For over a year, Leeann was tested for hearing loss. Each time, the Nolands were told that if there was a problem, it was not a serious loss. When questioned about her verbalization, “she’s mentally retarded” was the pat answer. This did not answer the questions! When Leeann was 2 1/2 years old, Leeann’s speech therapist, Donna Horn, had had enough. She knew that Leeann’s language skills were behind those of other children with Down syndrome. Donna convinced Leeann’s parent to take her to the University of Cincinnati for further testing. A brain stem examination revealed that Leeann was profoundly deaf and had been since the trauma at birth. This was such a hard blow for the parents, not only did it mean a silent world for Leeann, but it meant a whole new approach to teaching Leeann; a whole new language! The staff at the preschool did not know sign language, as this program was set up to help intellectually disabled children, not deaf children. From that very moment, the Nolands found that Leeann would present a very unique situation to the rest of the world. The great thing is, Ellen Perry, the Director of the program said, “We’ll learn sign, we’ll figure out how to teach this child!” Less than one month later, one night at dinner, Leeann used a sign at the table. Her parents did not know what she meant. The next day Betsy asked Leeann’s teacher what the sign meant. Her teacher was ecstatic! Leeann had asked for more potatoes! The entire Noland family was now facing two major handicapping problems. Leeann had been dealing with deafness from the very start – this was only new to her parents. How exciting it was for Leeann to finally be able to express herself to others! Throughout all of her time at the preschool, Leeann showed what a trooper she was. Leeann was plagued with health problems related to her lungs – respiratory infections, ear infections, ear tubes, tonsillectomy, etc. Through it all, she bounced back and progressed. She was and is such an outgoing, happy individual. Leeann truly makes the best of every situation, no matter how bad. She did not become frustrated with her inability to express verbally; she just worked harder to make the rest of the world know she had a lot to offer. The one thing that has been evident throughout Leeann’s life is that she has a positive impact on everyone she meets. Leeann offers unconditional love and acceptance to all who come near her. She is such a hard worker because she has had to work harder to achieve everything. Once Leeann understands a task put before her, she will stick with it until it is done. She has tremendous pride in herself and her work. She is very much a “people person.” She gravitates to children and the elderly and is particularly sensitive to those who have physical difficulties, requiring a wheel chair or walker. Once when Leeann was about 8 years old, she and her mother saw a young girl in the grocery store who had been severely burned on her face, neck and arm. This girl was severely disfigured and Betsy worried that Leeann would stare inappropriately or even fear the girl. Just the opposite occurred. Leeann hurried over to the girl, tapped her on the arm, smiled and gave her a hug. The girl was very moved by Leeann’s gesture and her mother was shown once again what a special child she had! In 1993, Leeann had another major surgery, a cochlear implant. This surgery was to give Leeann a chance to hear something. The professionals did not think Leeann was a good candidate – she could not provide good feedback because of her intellectual disability. They felt she might not be tolerant of the noise. Betsy and Larry convinced the doctors that it was unfair to exclude Leeann from consideration because of her double handicap. Besides, Leeann was the most tolerant kid around, she put up with everyone not understanding her! Since this surgery, she has been face with one more challenge, to learn to use her newfound sound and figure out what it means. It has helped Leeann in that she can certainly hear “danger sounds” now and she can verbally say some things. The hope was that she would be able to understand more and more verbal commands which would help her in her future work setting – and it certainly has! Leeann presented such a unique situation that some other agencies did not feel they could deal with her problems. This is one of the reasons Growing Together Preschool is so dear to the heart of the Nolands. Their passion for the program extended beyond their own child and Betsy became one of the founding members of the Growing Together Preschool Board of Directors when GTP broke off from BARC to move beyond serving children with only disabilities to pioneering the inclusion model in the bluegrass. After graduating from GTP, Leeann became involved with Special Olympics, the Lexington Fayette County Parks and Recreation Program for Special Populations and the Central Kentucky Riding for the Handicapped Program. 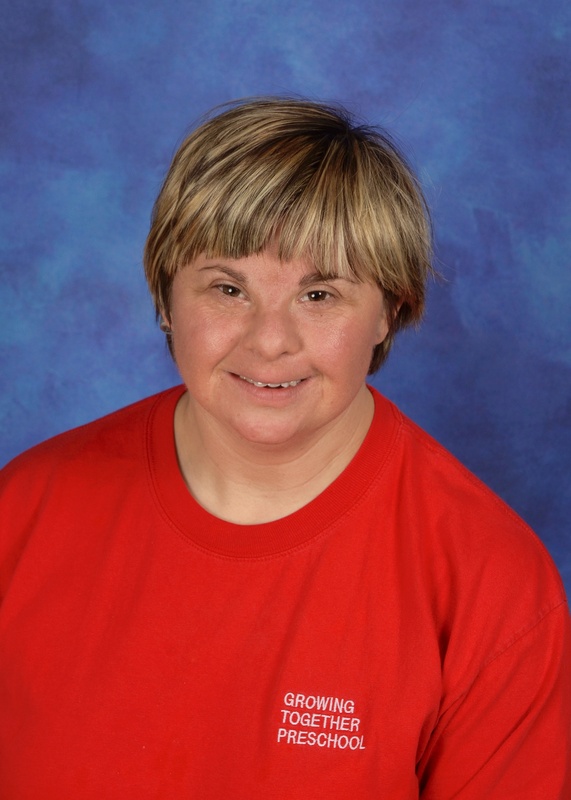 Leeann has been a cheerleader and equestrian in Special Olympics and a swimmer in the Parks Program. Each of these programs built on the foundation of inclusion offered at GTP. Leeann slicing pears for snack. She loves her work! Leeann has now come full circle! In May of 1998, Leeann graduated from Henry Clay High School. Through the work placement program there, she began training for a job at Growing Together Preschool. Leeann has been working in the kitchen, assisting with numerous duties, as well as bringing her own special brand of caring to the children who are enrolled in the program. She began with Growing Together as a child, learning basic skills to becoming an employee of that same program. If you’ve been to Growing Together Preschool, you’ve probably seen Leeann either serving children in the cafeteria or waiting for her ride in the hall. She waves hello and chats with everyone who walks by. He truly makes GTP a happier place. When the rest of the adults are bogged down in the daily stress of caring for children, Leeann makes us smile by pulling a prank, breaking out in dance or making a funny face. She is so happy to be here! She loves the children, the staff and the work. Her parents are overjoyed to once again have Leeann be involved with this unique and wonderful program. The Noland family is once again overwhelmed at what Growing Together Preschool means to them. 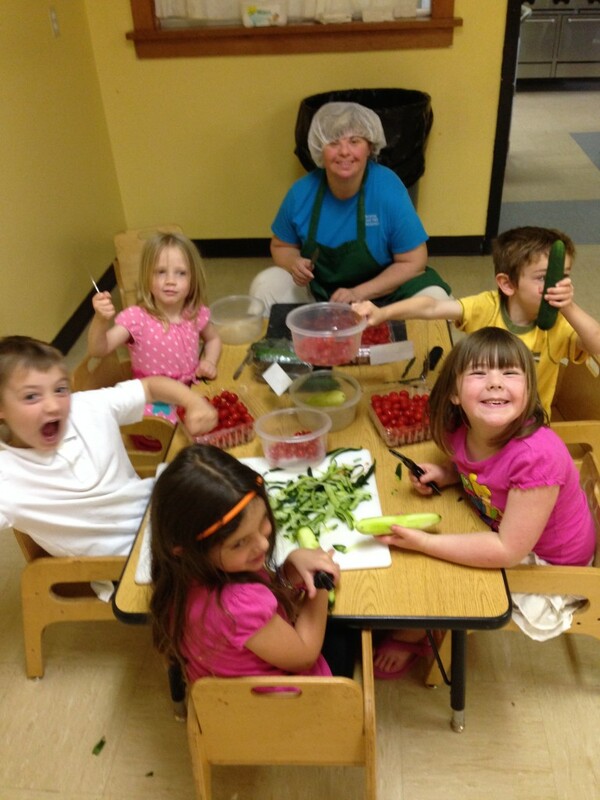 Leeann and PreKindergarteners preparing chef salad for lunch and loving it! « When Is Food About More Than Food? 4 Comments on Have You Met Leeann? What a wonderful story! I know my grandson, Oliver Dickson, has been enrolled in a very special school! Beautifully written about a beautiful person! I worked at GTP for 7 years and never saw Leeann without a wonderful smile on her face! I miss her and all of you! Loved the article….sounds as though Leeann is truly a blessing to all she comes in contact with….my meeting of ALL children with Down’s is that they have a very loving & caring soul…prayers for continued attributes from this wonderful young lady…. I remember the day that Leeann was born. Her grandparents lived next door to our family. They were devestated when she was born with so many handicaps. As the years went by they were so proud of this little girl that never gave up. I only knew one sign and that was “I love you”. She always laughed at me when I signed it to her. I bet she thought that I was such a dummy because that was all that I could say. Betsy Noland was and is a wonderful mother. She has worked all of her life to care for this child. After they moved to Lexington and after Betsy’s parents died I lost touch with them but on special occasions when I saw her we always signed, I Love You.